Oktoberfest is almost over and I couldn’t let it slip away without doing at least one post! This is the first year where I have actually found two beers I love during Oktoberfest. I think it’s primarily because Fall is the best season and all the best things come out around this time of year. Both of them are unique – which is probably why I like them – and both are by New Belgium (there’s some sort of conspiracy happening I think…). Have you tried Pumpkick and the Salted Belgian Chocolate Stout yet?? OMG they are incredible – seriously, really really good. As an homage to Oktoberfest and the fact that I found two beers I can drink alone (i.e. 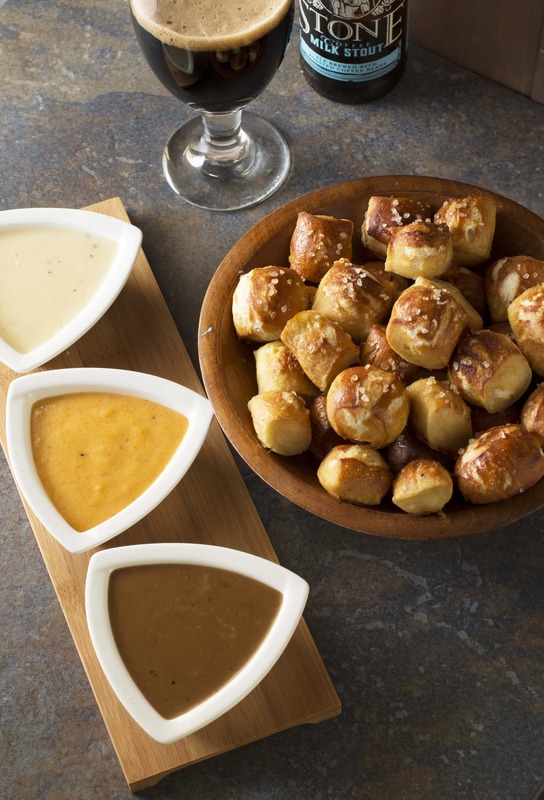 without polluting with other ingredients or incorporating solely into food for consumption), I have created a trio of beer cheese dips to go along with perfectly salted pretzel bites. What could be a better celebration of beer, amIright?? 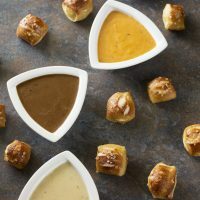 Make all three or make your favorite, regardless you’ll be rewarded with a cheesey beer flavor explosion in your mouth! The stout cheese dip is creamy, deep in flavor and comforting, transporting me instantly back to Ireland with that oh-so delightful Dubliner cheese. 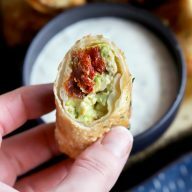 The spicy pale ale dip has a subtle beer flavor but packs a kick of spice and sharp tangy cheddar. Then there’s the saison cheese dip which has just the right amount of floral notes, nestled in smooth mozzarella and herbs. 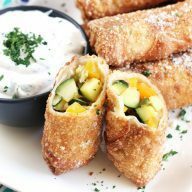 You’ll feel like you are in the heart of an Oktoberfest celebration when you break these out because everyone will be scrambling to stuff as much as they can in their mouths! I used the Soft Pretzel Bites recipe from Two Peas & Their Pod and they turned out perfectly! 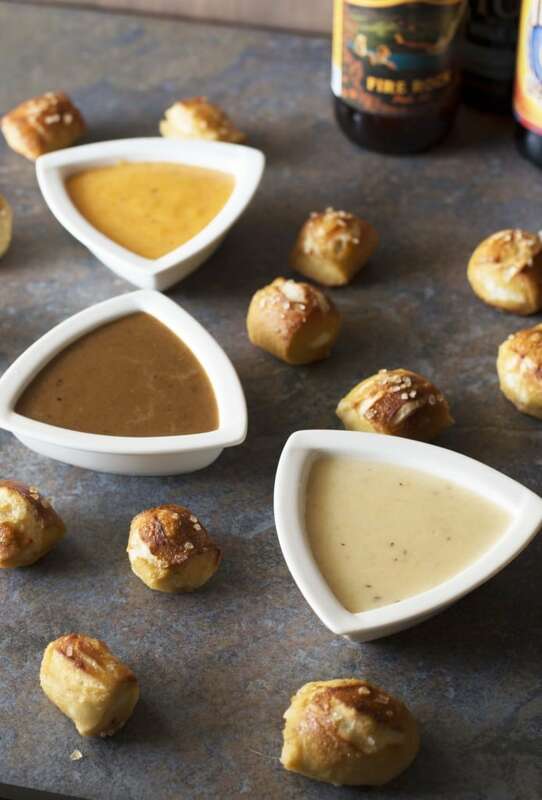 A delicious trio of beer cheese dips made with stout, pale ale, and saison beers. Celebrate Oktoberfest right! 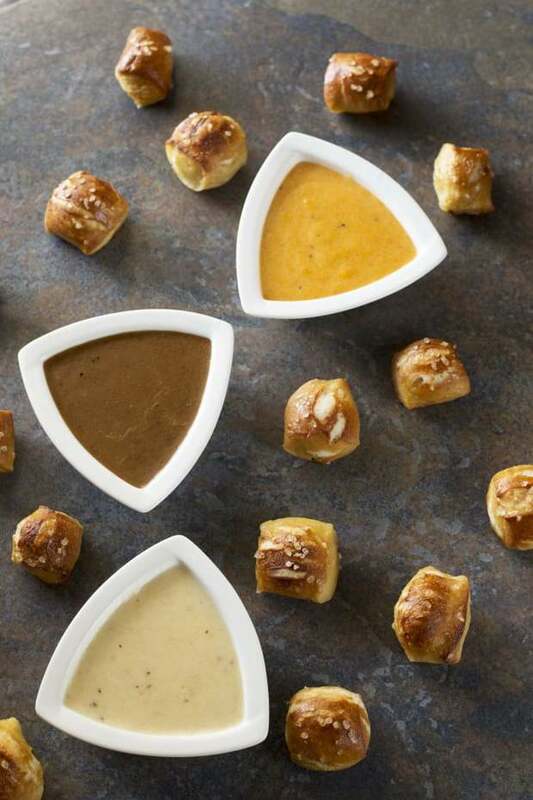 Each of these beer cheese dips follows the same set of instructions. For each dip, follow the instructions below using each set of ingredients. Start by making a roux. Melt the butter over medium heat. Add the flour and cook for 1 minute, stirring constantly.Whisk in the milk and beer. Cook until thickened slightly, approximately 3-5 minutes. Remove from heat and stir in the freshly grated cheese and spices. Season with salt and pepper to taste. Repeat this process with the remaining 2 dips. Serve immediately with warm, freshly baked pretzel bites. 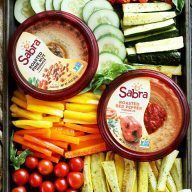 I went to an Oktoberfest party on the weekend and I WISH we had these dips with our pretzels, they sound amazing! Wait, Oktoberfest is almost over?!?! It’s still 100F here in Phoenix! I’m unofficially starting Oktoberfest now for us desert rats.